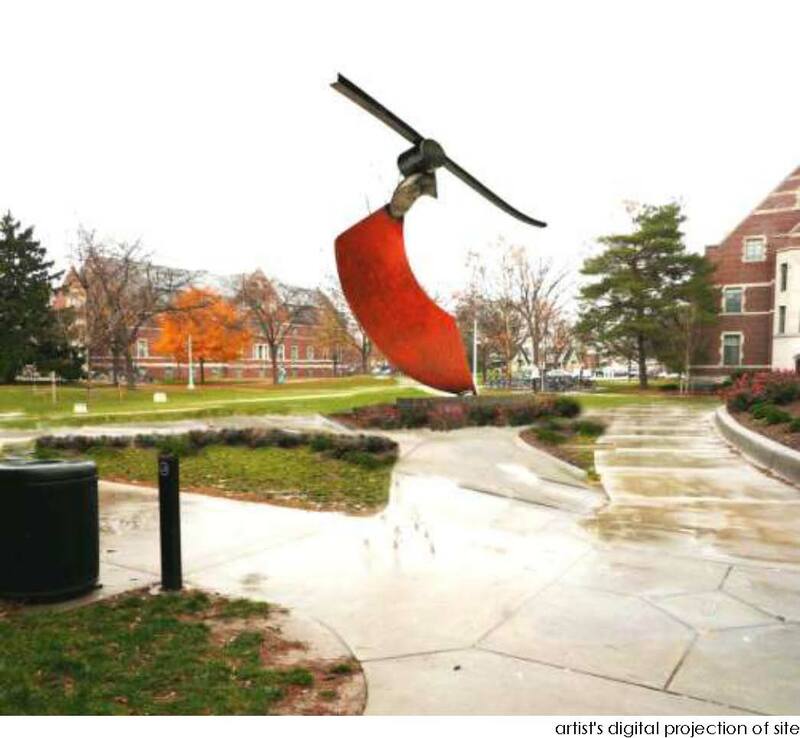 The proposed work, FUNAMBULIST (red velum), is a dynamic and graceful free standing sculpture deigned to catch the eyes and minds of its viewers and to reflect positively on Snyder-Phillips Hall, MSU students, faculty and the campus as a whole. Because of its scale, visual strength and location it will make a lasting impression on those entering and using the building as well as viewers from a distance. Funambulist will play a critical roll in shaping a positive image for all associated with the site. 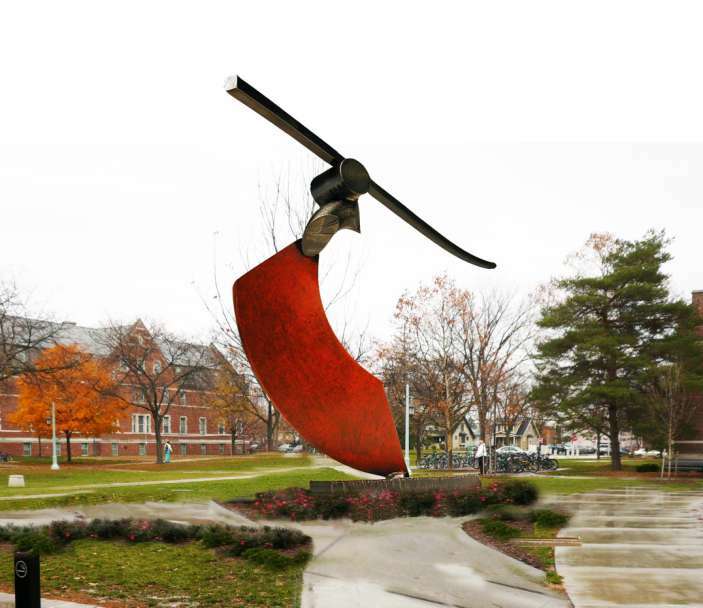 All successful public art operates on more than one level. First, it must have a compelling visual presence that catches and impresses the eye. Next it must make some connection to the viewer's world or experiences in order to resonate. Last, it must present ideas or concepts that intellectually challenge and engage. I believe this project does all. 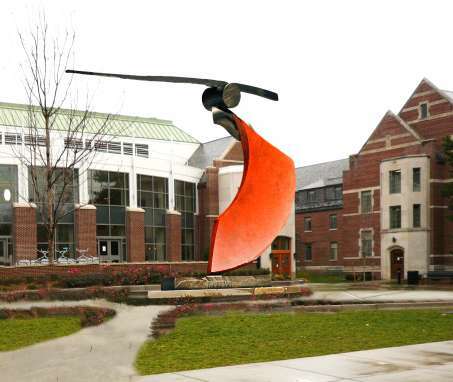 The title first makes reference to a "tight rope walker" by way of the sculpture's dynamic, horizontal "balanced baton" and poised positioning of the sculpture's overall shape. It suggests great physical balance, agility and daring -bringing to mind for some a circus performer. But the term Funambulist also and perhaps more poignantly, refers to metal agility. 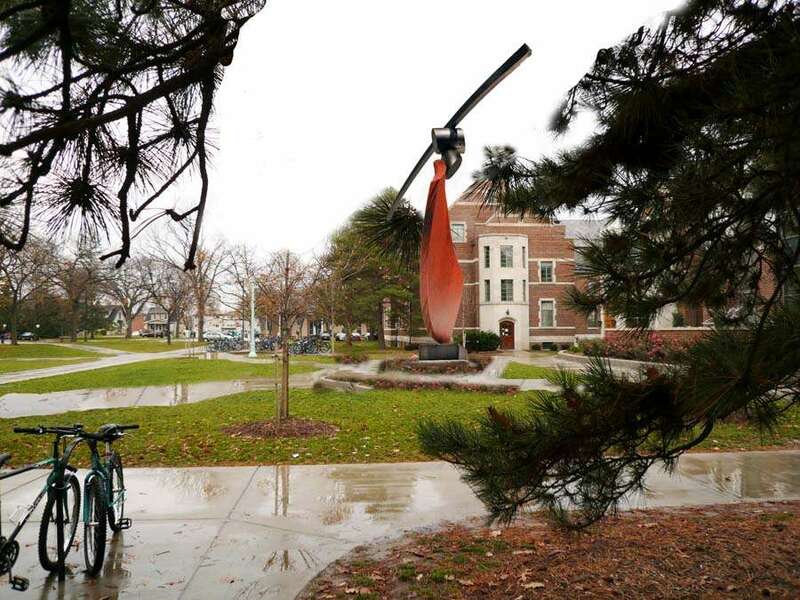 It is the precisely the union of these concepts; the formal and conceptual, that creates an appropriate metaphor for MSU student and college students in general as they perform their precious and daring balancing act and navigate through this very important and formative time in their lives. 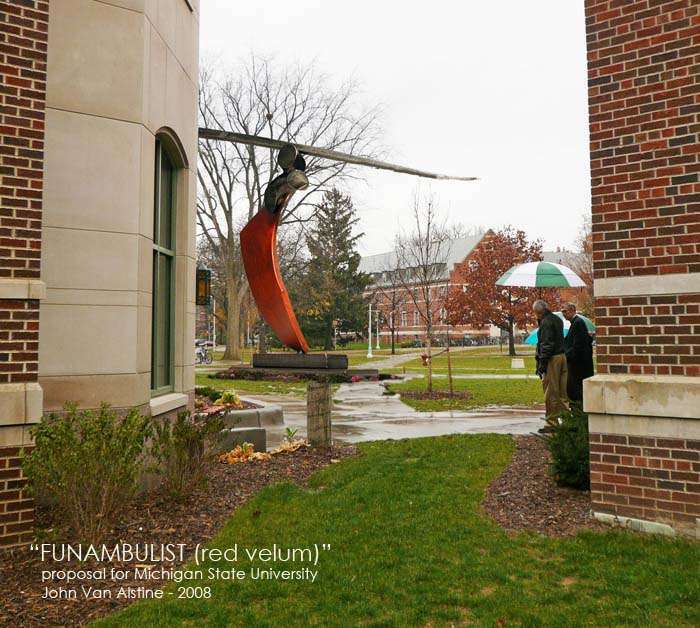 Relative to my own person style or "sculptural vocabulary", FUNAMBULIST (red velum) is an extension both formally and conceptually. The last part of the title "red velum" comes from Latin where "velum" means "sail" and refers to the large, bellowing, "sail like" red element that dramatically animates the sculpture. My work generally involves engaging, elevating and balancing heavy or earthbound objects -choreographing them in a way that makes them come to life. 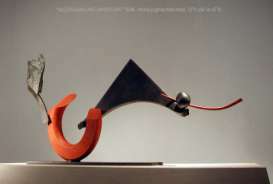 This piece exhibits a great sense of balance and choreography and combined with its association to the sail -a form magnificently shaped by the ephemeral forces of the wind -sets up a juxtaposition between the heaviness of steel and the fleeting forces of the wind, creating a compelling visual and intellectual irony. Because of the importance of the location and the desired objective of making a strong visual statement the work must be substantial -20-25 feet tall. 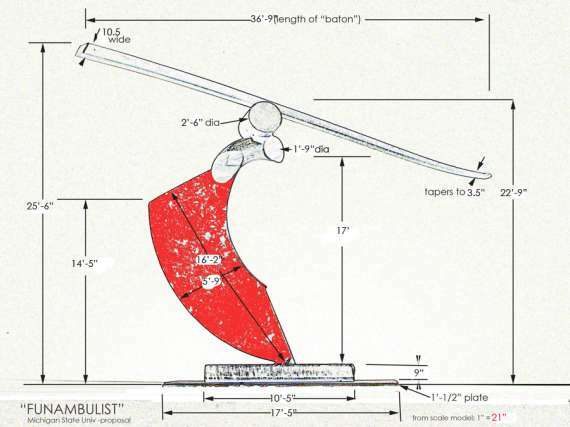 The work will be fabricated steel and perhaps some elements aluminum, industrially sandblasted, primed and painted with UV protective paints. Welded, bolted, riveted and anchored as per engineering specs. site prep -Proper foundation and anchoring will be coordinated with licensed engineers in partnership with MSU Campus Planning and Administration. 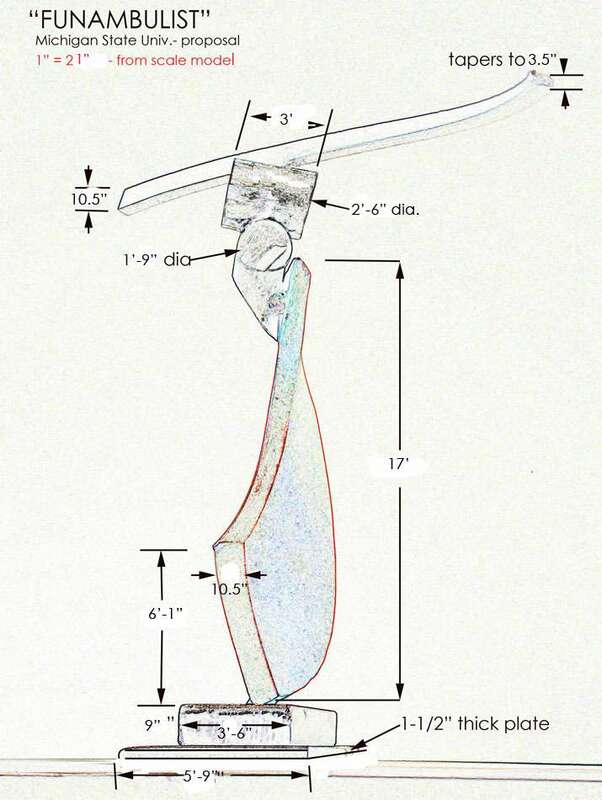 Installation -will be contracted to a professional sculpture installation company familiar with my work to insure the most efficient, safe and least disruptive situation.